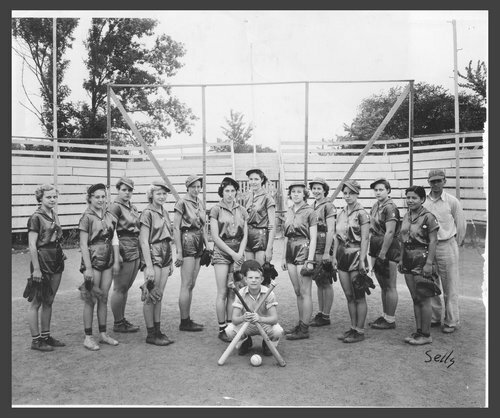 This black and white photograph shows the Ed Marling's Sunflower Girls softball team from Topeka, Kansas. The team members have been identified from left to right: Lela Adkins, Amelia Quast, Bernie Maxwell, Pearl Timble, Hazel Bartlett, Mary Young, Ruth Shears, Frances Dahlstrom, Lily Woods, Inez Quickbear, Anna Snook, Dorothy Garnett, and C.H. Crites, manager.